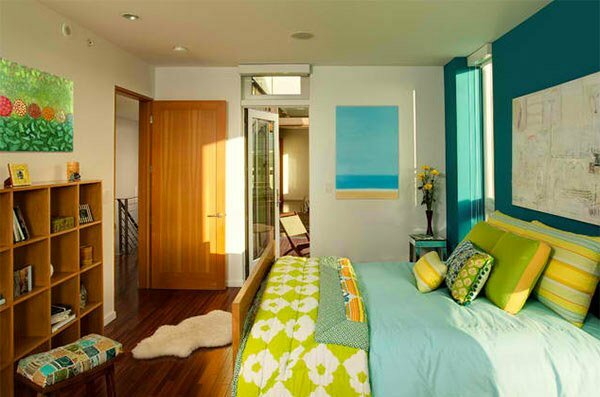 We have seen different color combinations for a bedroom. And we are sure that you were able to get ideas on what you can do with your own bedroom. But aside from the one we have already featured, there are still other color combos that will also look amazing for a bedroom. This will encourage you to experiment with colors especially with those shades that you love. 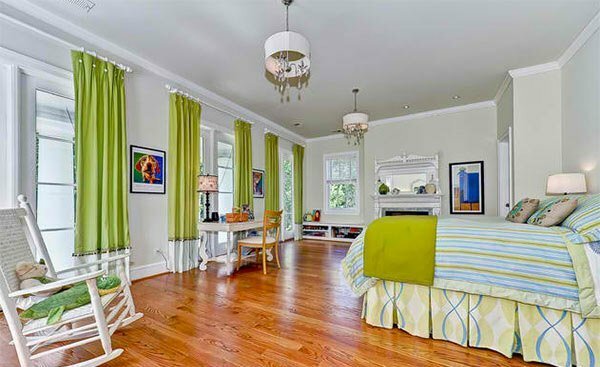 Today, we have gathered bedrooms that used blue and lime green colors. These are seen in different items like the furniture, decorations, drapes, bed covers, walls, flooring and others. 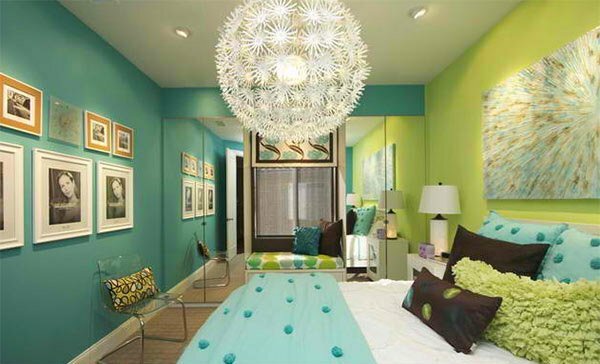 You will also see that each bedroom has varied approaches when it comes to designing using these colors. Come take a look at what we have collated for you. This teenage bedroom is done by request of the owner. She wanted a colorful, patterned, ethnic vibe for her bedroom inspired by the bold and bright colors used in Latin American design. White is still the primary color of the bedroom but it was charmed with a Shangri-La Masland rug and chairs from DR Kincaid Chair Co. 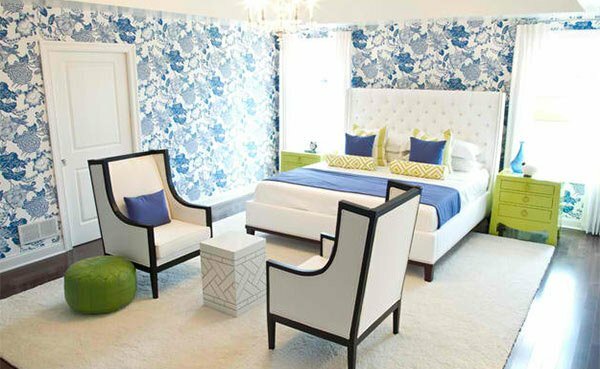 The wall and pillows are in blue while lime green accents are seen in the bedside table and ottoman. The room feels more layered and interesting with a few mismatched items. It is likely brighter but not overwhelmingly bright due to its lighting and colors. When we saw this bedroom, we were reminded of a peacock because of its design and colors. But it does have some funky accents too. 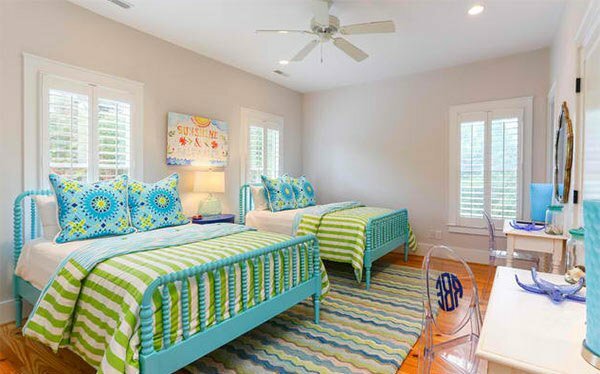 A twin’s bedroom gets a lovely appeal with the colors and patterns in it. We like the design of the pillows! 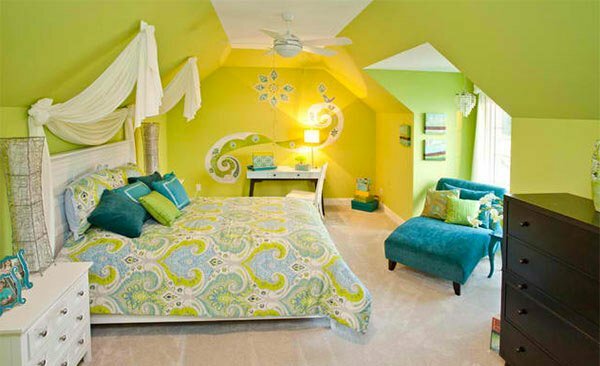 This contemporary bedroom has some beach-y feel as it combined blue and lime green as well as some yellow colors too! It also has some floral patterns everywhere. This bedroom is love! The print and color of the duvet set creates a dashing statement to this room with blue wallpaper. This room screams girly fun! It is designed for a nine year old girl featuring the contrasting colors of turquoise, black, white & lime green. 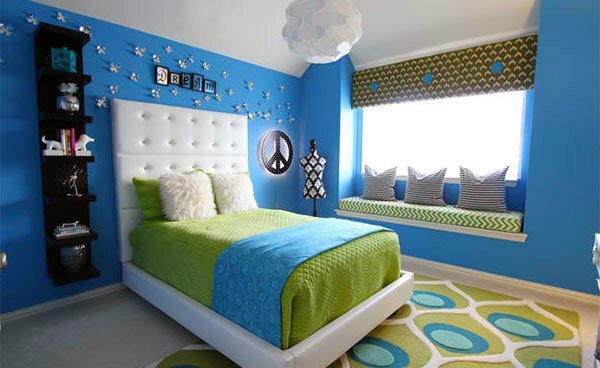 A beautiful bedroom that has colors that will make you feel like diving right into the bed. The wall art is very attractive! We know you have seen this bedroom before but we really like it that we can’t help but include it in the list again! We like the purple, blue and lime green combination! A box-shaped bedroom was turned into this absolutely stunning space! Who will not fall in love with this? 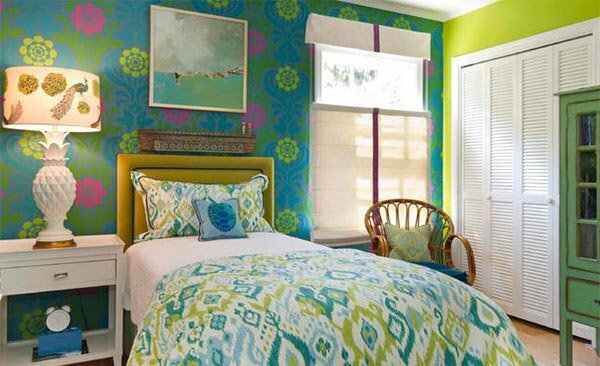 Paisley patterns on the wall add some vivid touch to this bedroom. Take a look at the bed’s design too. It has drawers at the bed’s bottom as well as its bench at the foot which happens to be connected to the bed. 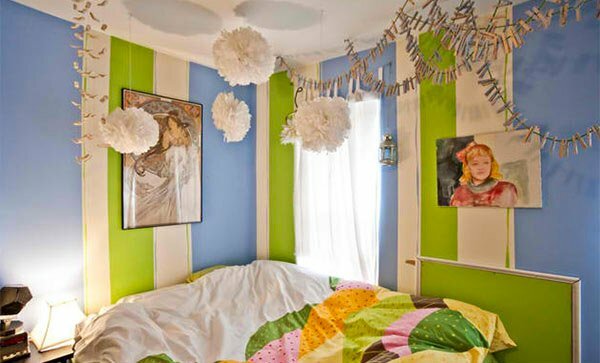 The bedroom is painted in lime green and blue stripes decorated with handmade paper pom-poms and a collection of clothespins that hang from the ceiling. Interesting! This bedroom has a minimal look but still looks fun because of its colors. 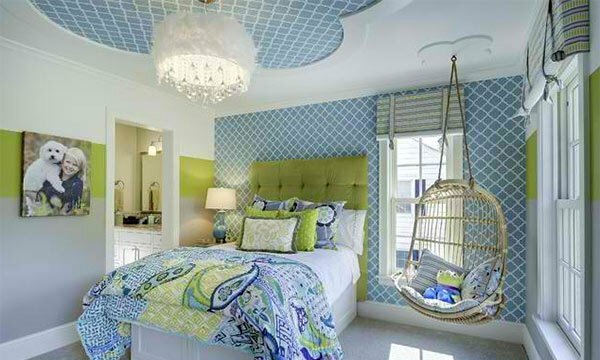 Lime green drapes and accents are seen in this bedroom which also combined different patterns with blue colors. Cute right? Well, we can really do a lot of color combinations as long as they are linked in the color wheel or sometimes, even if they are not. To come up with colors like this, you can start by thinking of your fave colors. Then check if they look good together, if not, try adding some friendly colors that match well with all the colors like black, white and gray. You can also check on different color swatches and place them side by side. If you want to see how the colors can be used in a room, you can always check some lists like this here on Home Design Lover. Go check gorgeous grey, turquoise and yellow bedroom designs which is another example of stunning color combinations for the bedroom.